Valparaiso&apos;s Maplewood Cemetery is located just south of U.S. 30 and Valparaiso University at the intersection of Sturdy and Penna Hill Roads. It is the final resting place of dozens of Calumet Region Civil War veterans who witnessed some of the war&apos;s hardest fighting. One unique feature at Maplewood is a special plot set aside specifically for Civil War veterans by the Grand Army of the Republic, a post-war fraternal organization. 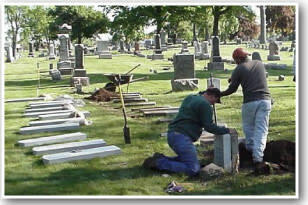 In 2011, 11 veterans buried in this City-owned and operated cemetery received new granite headstones through the efforts of the Calumet Region Civil War Preservation project.